Our quiet, beautiful setting on the west side of Newberry is only minutes from the downtown area, doctor’s offices, and Helen Newberry Joy Hospital. Open since the fall of 2001, we have been able to provide quality care for many of the area’s seniors. Our residence consists of 17 fully- furnished apartments, a welcoming lobby, a spacious kitchen and dining area, a comfortable family room, and a relaxing backyard garden and sitting area. Our limited residency allows us to provide personal assistance and a home-like environment for our clients. 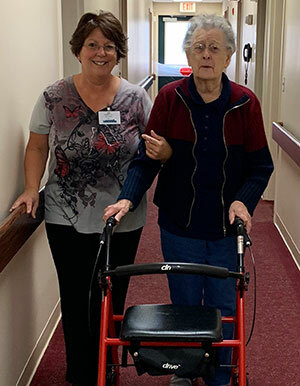 In addition to beautiful living space, Newberry Assisted Living offers exceptional care, delicious meals, extensive housekeeping, engaging social activities, comfortable transportation, and so much more by a highly-trained, caring and compassionate staff on hand 24 hours a day. We strive to maintain close relationships with our clients, their families, and their health care providers so that we may offer personalized care plans that reflect individual preferences, needs, and abilities. We understand that the decision to leave one’s home and familiar surroundings may be unsettling. Our community will make that transition a little easier. We are here to provide a comfortable, secure environment where you or your loved one can experience a fulfilling quality of life.